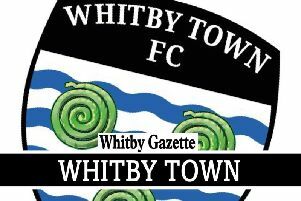 Tuesday’s night’s Evo-Stik Premier Division clash between Whitby Town and Ilkeston is off. The fixture, scheduled to take place at the Turnbull Ground, has been postponed due to the Robins’ ongoing suspension from football. The precise reason behind the Derbyshire outfit’s ban from taking part in matches is not yet known, however according to a statement on the Northern Premier League’s website, it is due to a “breach of the league rules and regulations”. Saturday’s home game with Stafford Rangers was also postponed. The Whitby Gazette’s sister title, the Ilkeston Advertiser understands the ongoing issues regarding their suspension will be resolved in due course, however action was taken on Monday to postpone Tuesday’s visit to Whitby. “It’s not ideal for us to lose a game at this stage of the season, but I’m not going to get too down about it,” Whitby boss Chris Hardy said of the postponement. “We have a fixture this coming Saturday anyway, so we now have more time to prepare for that. “We will train on Tuesday night instead of playing the Ilkeston game and it gives us an extra opportunity to work on making sure we’re ready for that. The players will also be fresher going into the next match.